Thanksgiving has come and gone, and with it we have reached the stretch drive ofAtlantic University Sport (AUS) soccer with only two weekends left in the regular season. To mark the occasion, the Gazette asked a panel of experts to give us their assessments of Dalhousie’s men’s and women’s soccer teams as they enter the playoff chase. 1. Which players deserve a shoutout for their first half play? GS: For the men, it goes to Bezick Evraire. He leads the league with 34 shots and works efficiently with captain Nathan Rogers. For the women, I don’t know if a single individual has stood out—but I think that’s a good thing. Every player is contributing evenly to the team’s early success. BM: Bezick Evraire and Kristy McGregor-Bales. Evraire is arguably the most fun player to watch in the AUS. He has always been graceful and skilled but now he is tougher and better conditioned. As for McGregor-Bales, she’s a wall on the back line. She never seems to make a bad decision and remains a nightmare for diminutive strikers. KMB: The first half of the season has truly been a team effort, as different players have stepped up at various moments. We wouldn’t be in our current position [tied for first in the AUS] without the effort put in by every player, coach and trainer. BB: Evraire, Rogers and leading scorer Tyler Lewars are integral to coach Nearing’s up-tempo offence. On the women’s side, Bianca Jakisa has led the attack, but special mention should go to the team’s resolute backs—including Kristy McGregor-Bales—as well as Taryn McKenna for her spot-duty shutout against Saint Mary’s last month. 2. What has been the most memorable moment of the season thus far? GS: Had to be when the men beat the 2012 AUS champions, the CBU Capers, in their opening game. I remember watching Tyler Lewars score the third and fourth goals and thinking that this team has what it takes. BM: For the women, it was the opening day shootout with Cape Breton at Wickwire—a 4-4 tie in a rematch of last year’s AUS championship. The men looked strong in a 2-0 win over St. FX at Wickwire, when Nathan Rogers put home a magnificent header off a delivery from Evraire. 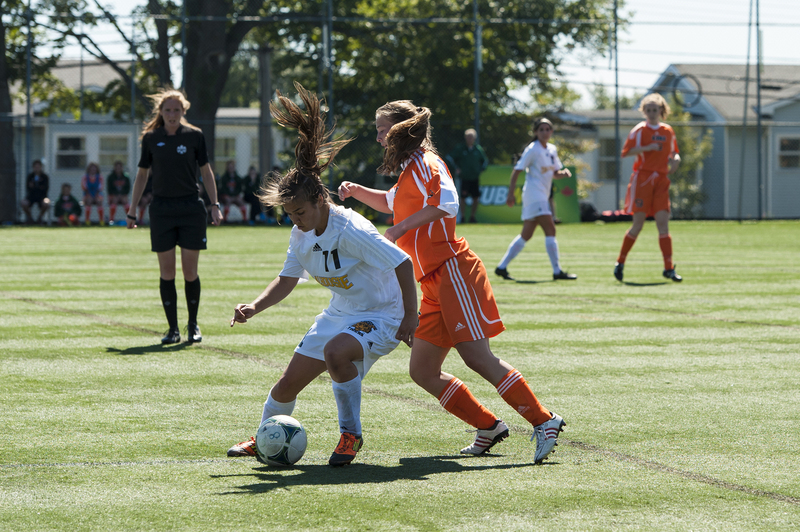 KMB: Our game against the Acadia Axewomen. We knew the match was going to be a very hard test, and it was competitive. We scored in the 89th minute to go up 1-0, then the next minute Acadia was inches away from tying the game. It was a crazy finish. BB: The early season Mount Allison road trip. The first away matches often set the tone for a season, and having both the men’s and women’s teams come away with victories was a key moment for each team. 3. What are the most daunting challenges facing the men’s and women’s teams? GS: The men’s biggest obstacle will be making the playoffs. They’ve got a huge two-game road trip coming up against Memorial University where they need to get at least three points. For the women, it’s going to be about consistency. Some days they come out to play and others they don’t. They’re going to need to find the right mindset if they want to go for a three-peat. BM: The rest of the women’s conference has caught up—there are six very good teams in the AUS this year. The men need to find some scoring, but that’s been a problem for years. With the playoff race getting tight, they need to sweep their trip to MUN. KMB: [Keeping focused on] the next practices and game. We are taking the season one practice and match at a time, so right now we are only looking forward to the upcoming games against Memorial. BB: Both teams play weekend series in Newfoundland and end the campaign with a two-game home-stand. These four matches are vital for the men’s team, who stand just outside a playoff berth. The women have a chance to secure the top seed in the AUS and home-field advantage for the playoffs, making these final matches critical.